Although the Earth has already been through phases of global warming, the current phase differs in its mainly human origin and its unprecedented speed. If we continue on the current trajectory of anthropogenic greenhouse gas emissions, which are the main driver of climate change, according to projections, by 2100, humanity will be living on a planet nearly 5°C warmer than in the pre-industrial era. The growing insistence of scientists and NGOs on the severity of the climate change underway, the radical transformations needed as a result and the urgency of such an ecological response, have led to the construction of an edifice of agreements that has been enhanced by two decades of international cooperation. The 3rd Earth Summit, held in Rio in 1992, was a decisive step along the path towards intergovernmental cooperation on the environment. The United Nations Framework Convention on Climate Change was adopted at this summit. This came into force on 21 March 1994 and is the legal basis for the multilateral action of the states that ratified it. These states are known as the Parties to the Convention and there are 197 of them, meaning that it has been almost universally adopted. The Parties come together at annual meetings of the Convention’s decision-making body, the Conference of the Parties (COP), and make decisions on the environmental policy to be followed in accordance with the Convention. The Kyoto Protocol and the Paris Agreement were signed within this framework, in 1997 and 2015 respectively. This last agreement, which became effective on 4 November 2016, is historic: in pursuing an ambitious target of limiting the global rise in temperatures to 2°C above pre-industrial levels and making the efforts necessary to further reduce this rise to 1.5°C, it is the first commitment by the international community to keeping global warming below a quantified threshold. It is therefore an instrument of mitigation through the reduction of global greenhouse gas emissions. Greenhouse gas emissions should be reduced through “nationally determined contributions” that the Parties plan to make and undertake to report on every five years. The Agreement includes an upwards revision mechanism, requiring that successive national contributions “represent a progression” on previous contributions and “reflect the highest possible ambition”. The Paris Agreement is also differential: it takes into account the Parties’ “common but differentiated responsibilities and respective capacities, in the light of different national circumstances”. It therefore stipulates that “developed countries should continue taking the lead by undertaking economy-wide absolute emission reduction targets”, while developing countries, for which the global capping of greenhouse gas emissions “will take more time”, undertake to first “continue enhancing their mitigation efforts” until they are able to set absolute reduction targets. There will also be a periodic “global stocktake” of the Agreement’s implementation in order to “assess collective progress”. The first will take place at the 2023 COP, and will be repeated every five years. The Paris Agreement: necessary but still inadequate? 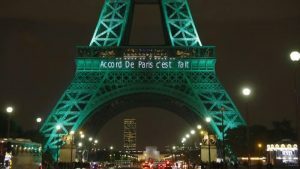 Although the Paris Agreement has been praised as a historic and highly encouraging event, it has also been much criticised. The primary criticism is the non-legally binding nature of states’ commitments, meaning that they don’t face any penalties if they fail to meet them. The international community should have made the agreement more incentive based, which would perhaps have entailed enforcement provisions, due to the urgency of the climate challenge. The mechanism for national contributions is nevertheless based on transparency, exposing states who fail to meet their publicly announced commitments to public condemnation. These national contributions, although they are supposed to reflect the “highest possible ambition”, are left to the states’ discretion, however. Already, in 2015, the Conference of the Parties, having adopted the Paris Agreement, noted in its final declaration that “the estimated aggregate greenhouse gas emission levels in 2025 and 2030 resulting from the intended nationally determined contributions do not fall within least-cost 2˚C scenarios but rather lead to a projected level of 55 gigatonnes in 2030”. It further noted that “much greater emission reduction efforts will be required than those associated with the intended nationally determined contributions in order to hold the increase in the global average temperature to below 2˚C above pre-industrial levels by reducing emissions to 40 gigatonnes”. By the way, the target of limiting global warming to 1.5°C above pre-industrial levels already seems impossible to reach given the rise in temperatures that is currently being seen. Its presence in the Agreement responds to the demand of the most vulnerable countries that are dangerously exposed to rising ocean levels. The Intergovernmental Panel on Climate Change (IPCC) has however highlighted the danger of a 2˚C target, pointing out that a certain number of damaging consequences for human being and eco-systems could be avoided by limiting global warming to 1,5°C1. The Paris Agreement provides, moreover, that developed countries must offer developing countries financial resources to help them with their climate change actions. Although the Parties agreed to an amount of no less than $100 billion a year, this amount was not included in the Agreement itself, but in the COP 21’s final declaration, which mitigates its legal force. Last but not least, the decision made by the US in 2017 to remove its signature from the Agreement also deprives the latter of the contribution of the planet’s foremost polluter (in terms of the quantity of CO2 emitted per inhabitant), and seriously jeopardises the reaching of its target. The Paris Agreement is still the most fully-formed expression of the global commitment to limiting global warming, and will therefore go down in the history of international environmental cooperation. It mustn’t end there though. As doubts are being heard from all sides about the likelihood of meeting the 2°C target, international multilateral action is still on the agenda. The Paris Agreement has only ever been a great tool, and it is up to the various countries to make use of it.